In June 2016, The Council on Education for Public Health (CEPH) Board of Councilors accredited the School of Public Health at Georgia State University. The school received a ‘met’ finding, the highest possible, on all criteria evaluated and the school’s initial school-level accreditation is for a five-year term, extending through July 1, 2021. The Georgia State 2015 self-study document can be found here. The CEPH 2016 site visit team’s report can be found here. 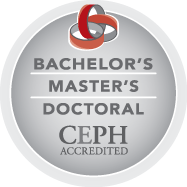 Georgia State’s Master of Public Health (MPH) degree has been accredited as a program by CEPH since 2007—making us the first public university in Atlanta to gain that distinction. The School began the rigorous process to transition from its MPH program-level-only accreditation to its new full school-level accreditation in 2013. This 2016 CEPH decision and school-level accreditation through July 1, 2021 was the culmination of that three-year process that involved the efforts of faculty, staff, students, alumni and community partners. The School is already in the process of preparing for its next accreditation review cycle in 2021. Public health at Georgia State has grown dramatically—from a graduate certificate program with a handful of enrolled students in 2002, to a full complement of programs, including a Bachelor of Science in Public Health, a graduate certificate, an MPH degree in five concentrations, a Ph.D. degree in four public health areas of knowledge, and our most recently established degree: a Doctor of Public Health (DrPH). Our MPH student body has grown from about 40 to more than 300 students—making it one of the largest and fastest-growing accredited programs in the Southeast. We have increased our faculty and staff to meet that demand, with a team of just five in 2004 growing to more than 120 employees today, with new distinguished faculty joining us nearly annually. The pool of Georgia State public health alumni continues to grow, too. Ours is one of the most diverse schools of public health in the nation—where nearly half of all students are minorities and several other students are from countries outside the U.S. Since 2006, we have been home to more than 50 Fulbright Scholars. Our faculty and students are conducting cutting-edge research and our centers are designing—and, perhaps more important, implementing—practical solutions, partnering with community organizations in Atlanta and beyond to develop answers to the challenges cities across the globe face in public health. Our metropolitan location is the ideal laboratory in which to test ways to address public health challenges in urban settings and for global populations, and we make Georgia State the first public university with a school of public health in Atlanta. Atlanta is home to a multitude of leading public health agencies and organizations, including the U.S. Centers for Disease Control and Prevention, the American Cancer Society and CARE International. Why is CEPH Accreditation Important to the School of Public Health at Georgia State? CEPH accreditation sets a standard by which all accredited schools of public health work to enhance health in human populations, through organized community effort. Accreditation assures the public that the school has met the most up-to-date standards established by the public health profession in the areas the school’s instruction, research, service, governance and administration. It gives the school’s students, instructors, and researchers eligibility for a greater number of funding and fellowship opportunities. Accreditation also assures students and their future employers that the school’s curriculum equips our graduates with the skills and knowledge needed for 21st century public health jobs. Finally, our CEPH accreditation allows us to be a member of the Association of Schools and Programs of Public Health (ASPPH, formerly ASPH), whose mission is to strengthen the capacity of members by advancing leadership, excellence, and collaboration for academic public health. *Georgia State University is accredited by the Southern Association of Colleges and Schools: Commission on Colleges (SACS-COC) to award associate’s, baccalaureate, masters, specialist and doctorate degrees. Contact the Commission on Colleges at 1866 Southern Lane, Decatur, GA 30033-4097 or call (404) 679-4500 for questions about the accreditation of Georgia State University.